Due to inadequate preservation, pterobranchs are often difficult to identify in the fossil record, and a better understanding of preservational modes and diagenetic and metamorphic effects is needed for their recognition. Pterobranch hemichordates are common in Cambrian Stage 5 and younger sedimentary rocks, but are frequently overlooked. Often, pterobranch hemichordate colonies have been considered to be algal remains or hydroids. 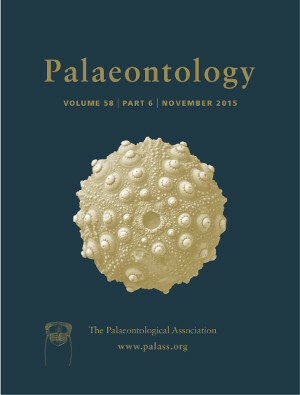 Re‐examination of Cambrian Burgess Shale algae reveals that the genera Yuknessia and Dalyia can be recognized as putative early representatives of pterobranch hemichordates. Distinct fusellar construction of the individual zooidal tubes and branching of the creeping proximal part of the colonies are found in the morphologically similar rhabdopleurid pterobranch genus Sphenoecium. The erect tubes of Sphenoecium do not branch and can reach a length of several centimetres. The development of the fusellar construction in this taxon shows a highly irregular development of the suture patterns, but a fairly consistent height of the individual fuselli. The taxon is widely distributed in the Cambrian Series 3, but has regularly been identified as a hydroid or an alga. Sphenoecium wheelerensis from the Cambrian Wheeler Shale of Utah is described as new.